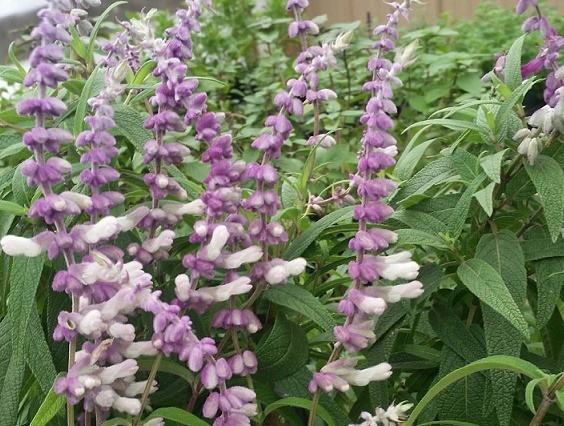 Mexican Bush Sage (salvia leucantha) Beautiful ornamental sage variety with silver green slender leaves and tall spikes of fuzzy purple and white flowers. Excellent cut flowers for bouquets, flowers also dry well for use in dried arrangements, wreaths, etc. Very heat and drought tolerant plant once established. Reported to be deer resistant can quickly form a bush to about 4'. Perennial zones 8-11. Live starter plant in 3 inch container. Arived in excellent condition and even though I am horrible at remembering to water my plants sometimes, I can't get this one to stop growing! Makes an excellent edition to the back patio or herb garden, but this one is not edible.